Leg or shin guards protect the front of the leg, knee, and top of the foot. When wearing your shin guards, the straps should not be too loose or too tight. If the straps are too lose, the gear will flop around and get in the way. Straps that are too tight will cause discomfort and become a distraction. Coaches should assist their young catchers to make sure the catcher's gear fits properly. Do not buy shin guards that are too large for your body, expecting to grow into them. This will only inhibit your movement and make your job a lot more difficult behind the plate. It pains me to see a youth baseball catcher trying to move around behind the plate, tripping all over their over-sized gear. 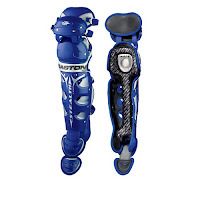 Some catcher's shin guards come with additional protection for the foot and toe areas. I find this extra protection to be cumbersome and get in the way. The extra protection can be removed and it is up to each individual catcher to decide what feels most comfortable, but yet still offer adequate protection. Baseball Rampage : Exclusive!!! - $10 off and Free shipping on orders over $99! Must use code BC10.